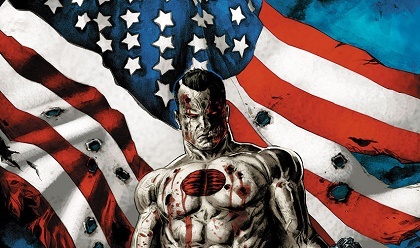 Bloodshot is cybernetic super soldier, a product of the Project Rising Star weapons development program, he is in fact considered to be their greatest accomplishment. His ventures have been explored in Valiant Comics since 1992. The nanotechnology enhanced veteran has experienced his share of hazardous missions in his new occupation as an operative for the H.A.R.D. Corps. In this new Bloodshot USA stand alone season, Project Rising Star are once more thick in the action. Continuing with their research to find the perfect weapon, they have invented a new advanced technology, an air borne nanite pathogen that is capable of reconfiguring DNA and physically morphing humans. The end result will be nanotech infused humans similar to Bloodshot. Unfortunately, the prototype pathogen has escaped into the population of New York, Bloodshot is locked in a race against time to prevent the virus from taking hold of the city. Jeff Lemire is scripting the season, he turned his hand to Bloodshot Reborn and is well known for his work on Justice League and All New Hawkeye. The art work is provided by Doug Brathwaite (Armor Hunters) and Kano (Ninjak, Superman). Both have previously illustrated Bloodshot comics. The first episode will be available on October 26th.